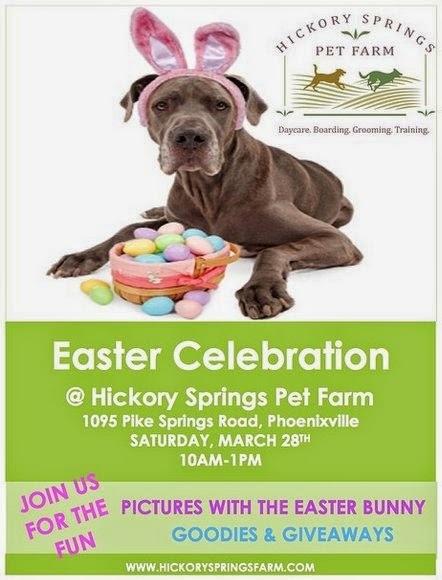 On Saturday, March 28th, Hickory Springs Pet Farm will be hosting an Easter Celebration. The event will be held from 10am-1pm and will feature pictures with the Easter Bunny, goodies and giveaways. Hickory Springs Pet Farm, 1095 Pike Springs Rd, Phoenixville, is a family-owned and operated cat and dog kennel nestled on 16 acres in the beautiful rolling hills of northern Chester County. They offer boarding, daycare, grooming and training services. For more information, please visit them at hickoryspringsfarm.com.